While doing some preservation reconnaissance on Chicago’s West Side yesterday morning, I had a chance to check out William Le Baron Jenney’s Douglas Park, one of the sprawling nineteenth century public parks that ring the city, all linked together by the green boulevard system. 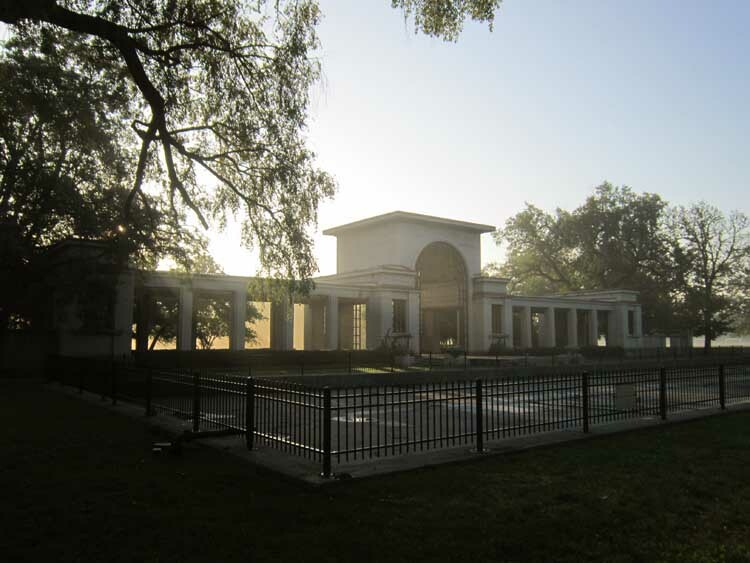 Set within the center of Douglas Park is the Prairie style-inspired Flower Hall, a reinforced concrete pavilion built around 1907. The Flower Hall was designed in part by the influential Danish-American landscape architect Jens Jensen (1860-1951) as the focal point for his semi-formal garden that unfolds to the hall’s west. 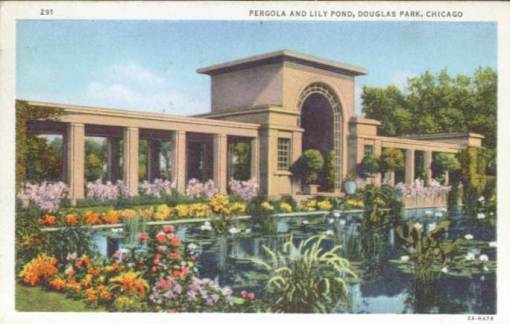 Along with Chicago’s Garfield Park Conservatory, Douglas Park’s Flower Hall was one of only a few buildings Jensen had a hand in designing during his career and was his own thoughtful effort at fusing architecture and landscape into one unified composition. Thanks to a restoration undertaken a decade ago, Douglas Park’s Flower Hall and its gardens still look as good as they did when Chicagoans got their first look at them 105 years ago. Being there alone in the early morning (except for a few joggers), it’s still possible to imagine the park as it once was back in1907.